Mod The Sims - Pescado's Sleepclock, cheaper looking. I've used Pescado's sleepclock since it came out to better manage my sims' sleep cycles, but I was annoyed that all of them owned the same model. 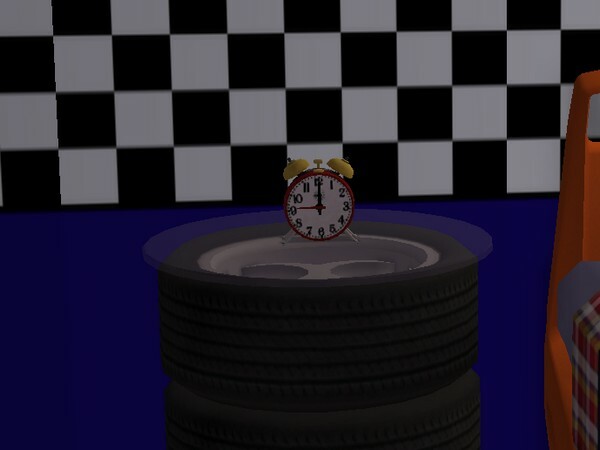 Since Pescado's policy allows it, I cloned his clock and made it use the basegame cheap model instead. It still has all the functions of the original, available here. For those who aren't familiar, it allows you to set a wake-up time for each sim (up to 2 sims per clock) and the game will automatically send your sims to bed when they reach an energy level low enough that they will wake up full of energy at the time you've set. Location: You can find it in Buy Mode / Electronics / Small electronics, at §250. Credit: all the coding is Pescado's. I've just changed a few words in SimPE and put a new GUID on it. Compatibility and conflicts: Compatible, in my experience, with Pescado's Director Cut, including the original sleepclock, Autonomous Casual Relationships by TwoJeff, Same energy gain for any bed by Marhis, Pets and Children share Bed by MogHughson, Sleepwear by personality by Cyjon.. Conflicts: none that I am aware of, but would likely conflict with any mod that affects the sims' bed time or wake up time. Sets the hour you want the setting sim to wake up. That sim will then wake up at that time if his energy bar is full, instead of at the utterly ridiculous, thoroughly boring, and very premature hour of 0600. Unless, of course, you specify an even more boring hour. Sim will not awaken even if his energy bar is full/you queue stuff until the appointed time, unless his energy bar is full 6 hours in advance of the time (as standard). 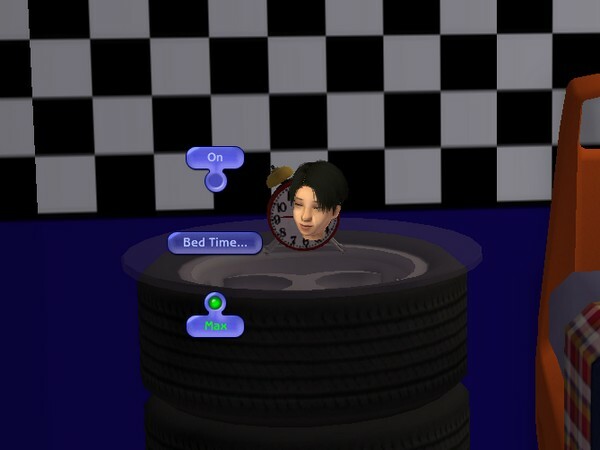 Only affects the targeted Sim if he sleeps in the room with the clock in it. Can store settings for two sims at a time. Only affects residents. Clears the assignment for a Sim so you can set a new setting for another Sim. Clock only holds settings for two Sims at a time, so if one Sim moves out or dies and you want to program for a new Sim, clear the absent Sim. Clock will automatically compute the hour at which your Sim should go to go to sleep based on your desired waking hour, the class of bed you have set, and the energy level of your Sim. The order to go to sleep on a bed in the same room as the clock will be automatically pushed at that time. Setting this to "Max" will result in the instruction overriding currently queued user orders. E8-40: 40 NRG/hr: vampire Coffin! Even for non-vampires! Selecting an incorrect bed type will result in the incorrect calculations. 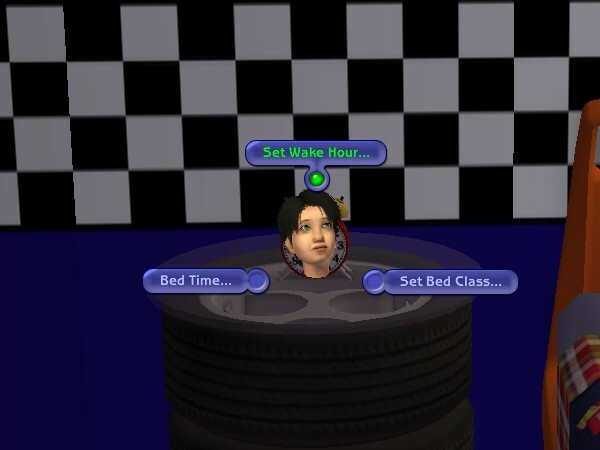 For best results, only one bed should be located in the vicinity of the clock: The bed chosen will always be the bed closest to the Sim after arriving at the clock. Sends a notification dialog of impending calculated time if turned on. Enables or disabled the Bed Nazi (NO BED FOR YOU!) for keeping other sims, especially visitors, dormies, autonomous sims, etc., from messing with the bed, causing the owner to find the bed is occupied by some moron. This hack is fully compatible with all Flying Fish Hacks. Tested for TS2NL v1.0p1 - TS2PETS. May cause computer damage, incontinence, explosion of user's head, coma, death, and/or halitosis. v3.1: Bed Nazi duelling clocks resolved. v2.1: Stole Grand Trianon support code from Inge. v2.0: New symbologies! New shiny transparent bed assignment routines! Shiny! I've never quite understood the bed class system, and frankly I don't use it. My sims go to bed even without it. 31 people have said thanks to Maraudine for this download. RoxEllen1965 Thanks for this. I love the idea of a cheap version. The "Bed Class" helps the clock calculate when to call your sim to bed if you've set a specific wake time. For example, if you've set your sim's wake-up time to 6 a.m., the clock will calculate what time the sim needs to go to bed in order to completely restore their energy by 6 a.m. This calculated bedtime will vary between bed classes because different beds have different energy recharge rates.